As much as I like the idea of a warm, cheesy meatball sub, they are really hard to eat! You take one bite and a meatball pops out from the opposite end, sauce squirts, cheese rolls off to one side, and I'm an adult! You don't even want to see my kids tackle one of these things...it's the stuff of nightmares and they really should use footage for one of those Bounty commercials. 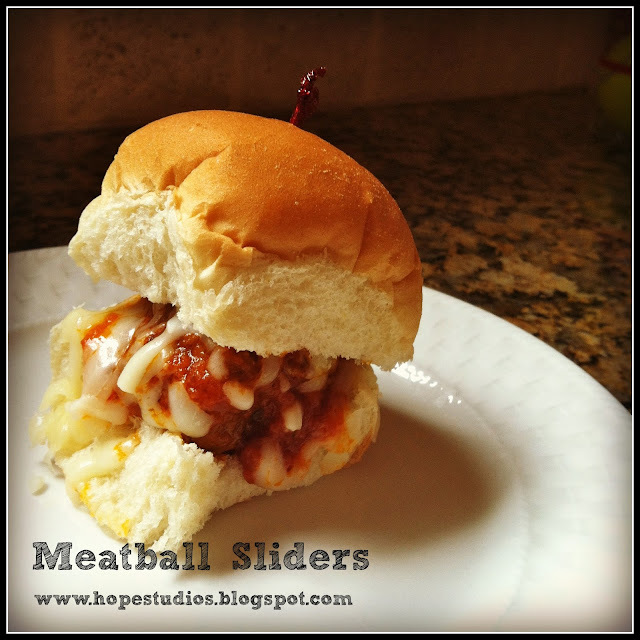 Meatball sliders are just the ticket! I like to buy the ready baked dinner rolls that are all attached in a pan shape at my local supermarket bakery. You can pull them apart and make single sliders, of if you are having a party, just cut the whole lot in half, line up your meatballs on each roll, top with cheese, pop on the top (stick a frilly toothpick into each roll at the top), and each guest can pull off their own slider. Easy peasy.